It’s that time of year, so start spreading that holiday cheer! Celebrating the holidays is one of my all-time favorite things to do, and if you are anything like me, you probably have a countdown until the next holiday…not just because that means a few days off from school, but because you can’t wait to celebrate the holidays with your sisters! It’s true, our sisters become like second family and we’ve been waiting all year to celebrate the holidays with them! Start the season off right and help your sisters decorate your sorority house with all the festive decorations you can find! There’s nothing that gets everyone in the holiday spirit better than a decorated winter wonderland so make your home away from home feel as festive as possible. For a fun and special twist, have a Christmas tree in one of the most visible parts of the house or chapter room and have every sister bring an ornament that she thinks represents her. With all your sister’s represented on one tree, it will sure to be the most special and photo-worthy part of the decor. Craft, Craft, Craft…I mean you wouldn’t be a true sorority girl if you don’t craft every once in a while! Whether you craft your own decorations, make your own holiday cards, or give the gift of handmade goodness, it will be sure to make the season brighter…and maybe more affordable! Plus it’s a great way to bond with your sisters, and who doesn’t love a handmade gift?! 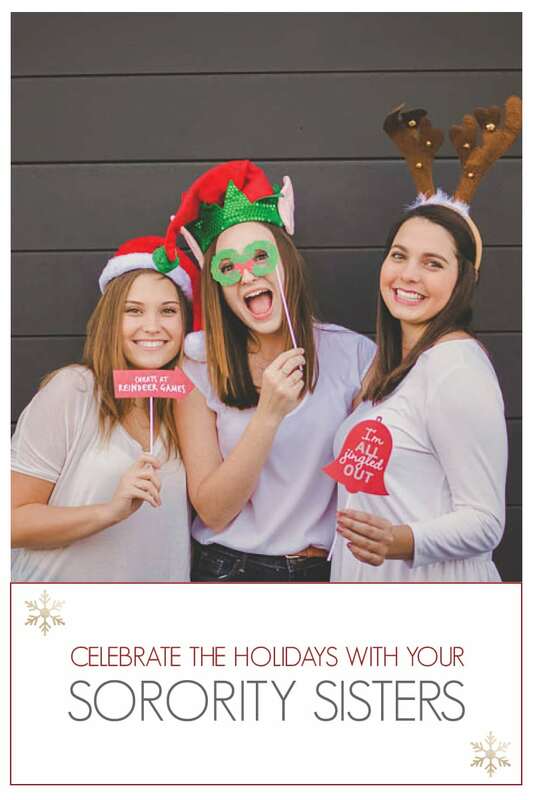 Help plan some festive holiday-themed activities with your sisters! Nothing beats a little extra holiday cheer, especially when your sisters are involved! Celebrate the end of the semester and the holiday season all in one with some extra cheerful sisterhoods! 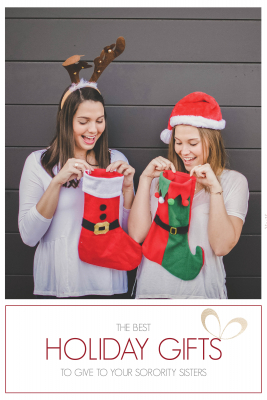 While this time of year is often the most stressful for you and your sisters, holiday-themed sisterhoods can take a little stress off their minds for a night! Lucky for you, our next post will be a list of our favorite Holiday Themed Sisterhoods you HAVE to do this Holiday Season. So keep an eye out for that! Here’s where some of that crafting can come in handy. You don’t have to break the bank just to show your sisters you thought of them during the holidays. Plan a gift exchange between your closest sisters or your Greek fam and set rules that the presents must be hand-crafted, have to stay within a budget, or have to be off one of A-List Greek’s awesome Gift Guides ;). 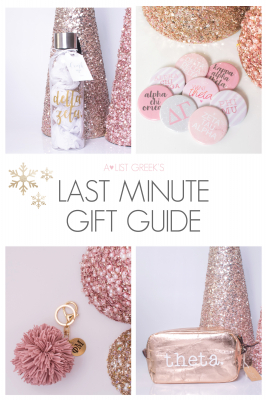 Our two favorites are linked down below but if you want to check out Sorority Specific Gift Guides, Gifts under $30 or Big/Lil Gift Guides, you can check them all out here! Some of us are lucky enough to go home to visit family, and others are excited to start new holiday traditions with sisters. Either way, if you follow these suggestions it’s bound to be a magical season! Make sure you tag us @a_listgreek on Instagram with all your holiday pictures, especially if you try out the Sisterhood Tree idea! We love seeing all the sisterhood love but especially during the holidays! This entry was posted in Members Only: A blog for chics and Greeks alike. 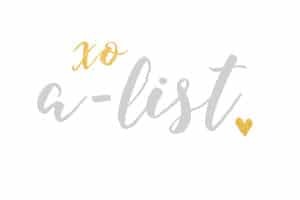 and tagged Christmas, Crafting, Gift Guide, Holiday, Sisterhood, Sisterhood Ideas.